Working with the master: "Paul was really interested in the fact that I was new and hadn't completely absorbed the same dance lexicon as everyone else," says Clayton of the experience creating Concertiana. 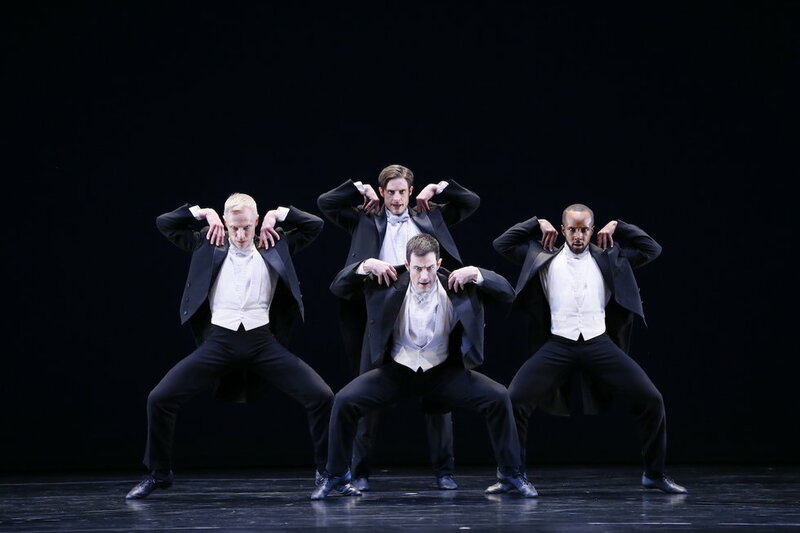 Before joining Taylor, he spent a year in Graham 2 and danced with the all-male contemporary company 10 Hairy Legs. "Even though I had been taking Taylor class for two years, I had all these other styles in my body. I did something accidentally one day and Paul said, 'Oh, I like that!' "
Clayton (at right) in the Taylor classic Cloven Kingdom. Photo by Paul B. Goode, Courtesy Paul Taylor American Modern Dance. Catching the dance bug: Clayton didn't start dancing seriously until he was 16. In high school, he focused on visual art—painting, drawing, textiles—and was planning to attend the Art Institute of Tennessee in Nashville. "Then I saw Ailey perform," he says. "At the time, I was struggling with being gay and finding myself attractive, and just to see beautiful black bodies dancing gave me hope." Driven to succeed: Clayton takes the truism of the highly motivated dancer to an extreme. He chose an accelerated college program, finishing in just three years. "My mother says I love obstacles," he says. Trusting himself: When he was about to graduate from college, Clayton's professors tried to dissuade him from spending an additional year training at The Ailey School. "But I really wanted to dance with people who looked like me and who were also incredibly talented," he says. "So I went. And it was the right thing. Remember, people give you advice based on their experience, not yours." "He's young, eager and quick to learn—and has a great sense of humor." Feeling connected: Even though Clayton moves with power and speed in works like Arden Court and Promethean Fire, his favorite Taylor role to date has been in Roses, a slow, almost cosmic dance about love, set to diaphanous music by Richard Wagner and Heinrich Baermann: "I love the romantic, tactile sensation of having this deep personal connection with one human for the entire piece."